Cantley is quite a large parish located in the southeast of Broadland, east of Norwich and west of Great Yarmouth. The River Yare forms its southern boundary whilst its other boundaries follow dykes, roads and other landscape features. The B1140 from South Walsham and Beighton enters the parish from the northeast and terminates at the River Yare, whilst the Norwich to Great Yarmouth railway passes through the south of the parish. Modern settlement is focused on the village of Cantley. The village is situated alongside the River Yare, the B1140 and a large sugar factory amongst low lying marshes. The land gradually rises up to the northeast of the marshes. The hamlets at Limpenhoe Hall, Limpenhoe, Southwood and Manor Farm are located on the higher land, although no part of the parish is much higher than 20m above sea level. 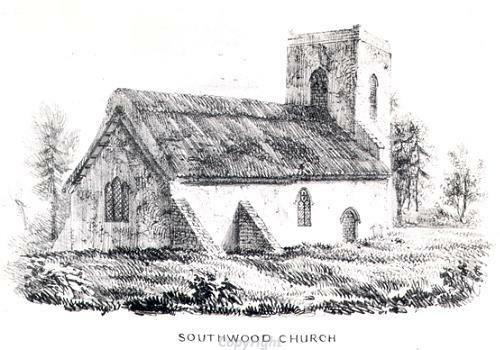 Limpenhoe and Southwood were once parishes in their own right. A Neolithic adze (NHER 10337) is the earliest datable artefact to have been found in the parish. It was found in the southeast of the parish, close to the River Yare. A flint flake of general prehistoric date has been discovered in a garden in the village. Two ring ditches have been recorded in the parish. One is located in the northwest and may be associated with an undated enclosure that surrounds it. The second is in the east and is close to several undated enclosures. Both ring ditches may be the remains of Bronze Age barrows. Three ring ditches in the north of the parish (NHER 6097) could also be barrows. However, as they are sited where a post mill is marked on Faden's map of 1797, they may have been associated with this or other mill buildings. A collection of undated cropmarks (NHER 13002) in the northeast of the parish may be a settlement or stock enclosure of Late Iron Age/Roman date (although they could equally be medieval). A field system that might be Roman in date has been identified straddling the Cantley/Beighton parish boundary. Roman objects have been found near to it, and a rectangular enclosure (NHER 10270) to the southwest and close to the Cantley/Strumpshaw boundary could be a Roman farmstead, sitting within the cropmarks of an extensive coaxial field system of probable Late Iron Age to Roman date. Reused Roman stonework features in both Cantley and Limpenhoe churches (NHER 10363 and 10364) and suggests the presence of one or several substantial Roman buildings in the parish or nearby. As the stone is similar to the Roman stone used in Reedham church, a site in Reedham may have been the source. Roman coins have been found at three sites close to Cantley church. At one of these sites a Roman spoon and pottery were also found. The only Saxon object found in the parish came from a site located between Cantley, Southwood and Limpenhoe. It is a Middle to Late Saxon hooked tag (NHER 40534). Cantley, Limpenhoe and Southwood appear as three separate settlements in the Domesday Book. All three have Old English names. Cantley is called ‘Cantelai’ meaning ‘Canta’s clearing’. Southwood appears as ‘Sudwda’ meaning ‘southern wood or upland’. Limpenhoe is recorded as ‘Limpeho’, ‘Limpa’s hill spur’. In 1086 Cantley was held by King William I, who also held part of Limpenhoe. William of Ecouis held part of Limpenhoe and part of Southwood. The last part of Limpenhoe was in the annexation of Baynard, as was part of Southwood. The remaining two sections of Southwood were held by Godric the Steward and Ralph Baynard. Smallholders, meadows and ploughs are listed at all three settlements, whilst freemen were recorded at both Cantley and Southwood. Villagers, slaves, woodland, pigs, a salthouse, cattle and sheep were also noted at Cantley. Both St Margaret’s Church, Cantley (NHER 10363) and St Botolph’s Church, Limpenhoe (NHER 10364) are medieval churches. St Margaret’s was restored around about 1867 and St Botolph’s was largely rebuilt in 1881. Although no medieval finds have been collected in the vicinity of Limpenhoe, objects have been found in at a number of sites around Cantley village. These could be casual losses by people living in medieval Cantley or part of manuring scatters. St Edmund’s Church, Southwood (NHER 10281) is now a ruin. The medieval chancel, nave and western tower survive but there is no roof. It is presently isolated west of the current hamlet, but in the medieval period it may have been sited closer to the settlement. Between the church and the hamlet are rectangular cropmarks (NHER 12986) that may be the remains of a deserted medieval village. A possible medieval field system has been recorded in the north of the parish. It is closest to Southwood and could have been associated with it (although the field system is also in the parish of Beighton). There may have been a medieval postmill (NHER 10352) to the northwest of Cantley village. As well as the postmill marked on Faden’s map in the northeast of the parish, there is a surviving post medieval windmill (NHER 10360) in the southeast of the parish, alongside the River Yare. To the east of this is a derelict mid 19th century wind pump (NHER 10361), whilst to the west is the site of a post medieval wind pump. The windmill and two wind pumps would all have been involved in draining the marshes. Southwood Hall (NHER 22027) dates mostly to the 18th century, with 17th and 19th century elements and additions. Two 18th century brick barns are close by. A post medieval well and floor (NHER 17563) have been recorded in Limpenhoe. Van Rossum, a Dutchman who introduced sugar beet as an arable crop to Norfolk, established the Cantley sugar factory in around 1910. In the early and mid 20th century the factory had a large lime kiln and narrow gauge railway (NHER 13754). David Robertson (NLA), 26th September 2005. David Gurney (NLA), 28 March 2008.
http://www.norfolkmills.co.uk/Millwrights/thorold-william.html. Accessed 26 September 2005.
http://www.origins.org.uk/genuki/NFK/places/l/limpenhoe/. Accessed 26 September 2005.